New restaurant owners Ewen Lovie and Noel Brown. 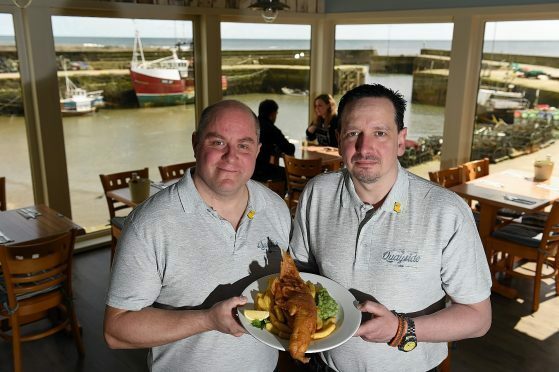 North-east restaurateurs Alex and Ruth Grahame have sold their award-winning Gourdon business, Hornblowers, just months after axing plans to open a bistro-style restaurant and takeaway in Aberdeen. Hornblowers, whose commitment to locally-caught seafood had earned it a string of honours over the years, has also had a change of name. New owners Ewen Lovie and Noel Brown took over the business earlier this month and renamed it The Quayside. Mr Lovie, who hails from Peterhead and now lives in Aberdeen, said: “We were looking to buy something and work together. Mr Lovie has previously worked for large restaurant chains including Frankie & Benny’s and Chiquito, as well as Cafe Society and Nero in Aberdeen. His business partner, who is originally from Inverurie but now lives in Gourdon, between Aberdeen and Montrose, can count on experience gained working for bar operator Belhaven in Granite City pub The Globe Inn. The Grahames, who had run the business since 2011, revealed last year they were seeking a buyer for Hornblowers. They obtained planning consent for a bistro-style restaurant and takeaway on the former site of Jimmy Chung’s restaurant at Aberdeen beach. But they pulled out of the move earlier this year, blaming “issues” with the developer and a drawn-out council planning approval process. Their decision not to go ahead potentially creates a big hole in Aberdeen’s beachfront area and has left the Grahames about £30,000 out of pocket. Yesterday, Mr Grahame said he and his wife were “looking at all options” but they planned to stay in the Aberdeen area. Plans to breathe new life into the former site of blaze-hit Jimmy Chung’s were approved by the council last July. The building, which housed Jimmy Chung’s, the Pier Bistro, TC Fish Restaurant and ADS Janitorial, burned down in February 2014, despite the efforts of more than 50 firefighters who battled the blaze. Mr Grahame’s proposed 16,000sq ft restaurant was to feature 250 seats over two floors, terracing, heated outdoor seating areas, an adjoining 650sq ft takeaway and 2,500sq ft ice-cream parlour. Two other restaurants, including a new Pier Bistro, were also to form part of the complex. Martin McAuley, owner of the Pier Bistro, has confirmed he is committed to reopening his business.